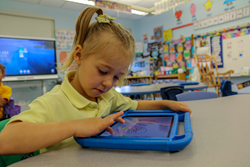 A pre-K student at Milton Hershey School utilized learning technology applications during class to share the gifts they would give to Milton Hershey. “As a community, we’re showing gratitude for a man whose hard work and dedication helped so many,” said MHS President Pete Gurt ’85. On Thursday, Sept. 13, the Milton Hershey School community is celebrating what would have been founder Milton Hershey’s 161st birthday. MHS students and staff plan to reflect on the legacy Mr. Hershey created when he founded the school in 1909. In honor of his birthday, pre-kindergarten students completed exercises using learning technology applications to share the gifts they would give to Milton Hershey. Elementary students also created art projects inspired by Mr. Hershey. MHS middle school students spent time reflecting on Milton Hershey’s legacy and vision by giving a toast with chocolate milk as they overlooked Hersheypark from Catherine Hall. Every student home on campus received a cake baked by the MHS food services team to honor the memory of Mr. Hershey’s 80th birthday when his employees surprised him with a three-foot high cake and 80 electric candles. This evening, MHS high school students will hand out homemade cupcakes baked by the MHS Food Services team during The Hershey Company’s birthday celebration. The event will be held in ChocolateTown Square from 6:30 to 7:30 p.m.
Milton Hershey School began as a dream and vision shared by chocolate magnate Milton Hershey and his wife Catherine. Unable to have children of their own, the Hersheys decided to use their wealth to create a home and school for children from low-income backgrounds. More than 100 years later, Milton Hershey School has more than 2,000 current students from pre-k through 12th grade and more than 10,000 graduates. More information can be found at mhskids.org.